Users can highlight structures in the Molecular Machinery viewer based on functional category. 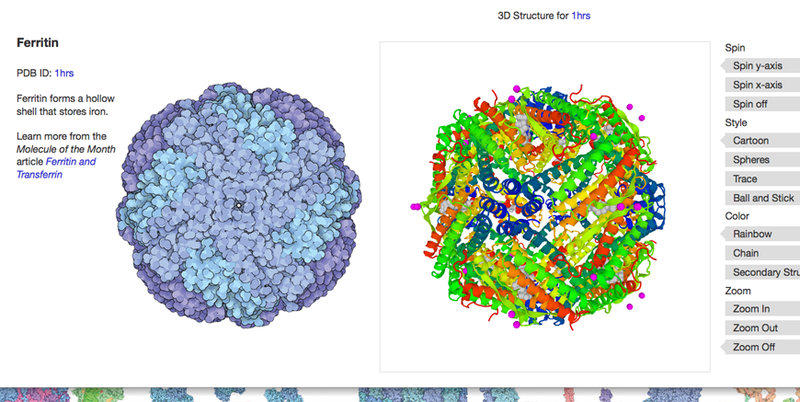 Users can select a structure and access the entry in 3D using Protein Viewer (PV). 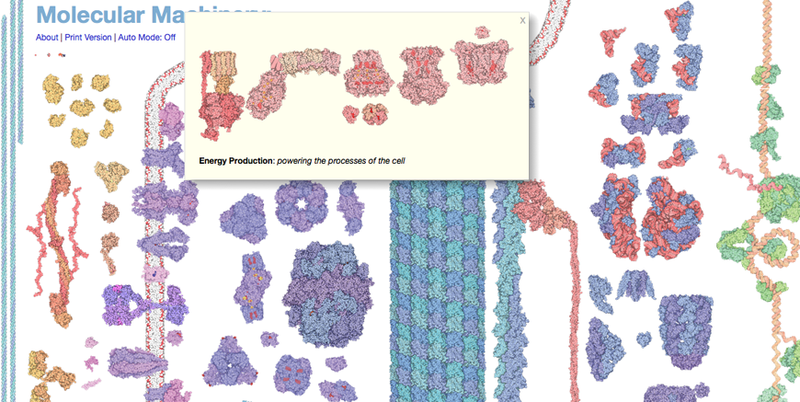 A new interactive viewer animates RCSB PDB's popular Molecular Machinery poster in 3D. 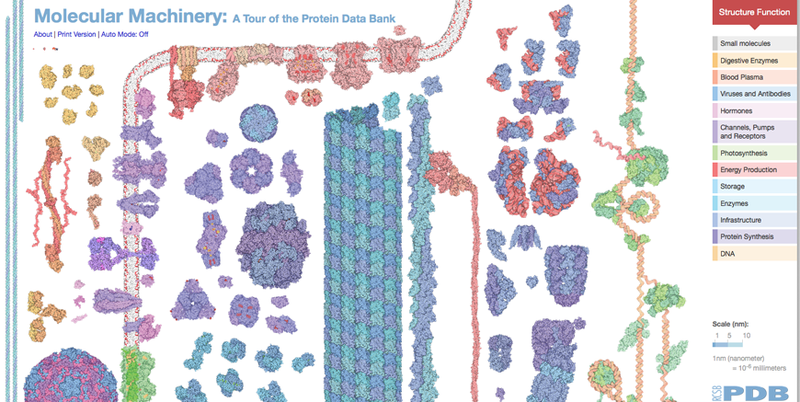 In 2014, Molecular Machinery: A Tour of the Protein Data Bank was published to celebrate the milestone 100,000 entries released in the PDB archive. Ninety-six structures illustrate the vast range of molecular shapes and sizes in the PDB. These structures are depicted relative to the cellular membrane and organized in categories related to function. A scale bar provides a sense of molecular size in nanometers. An interactive viewer for this Molecular Machinery poster has been released just as the archive reached more than 100,000 protein structures. The viewer lets users select a structure, access the entry in 3D using Protein Viewer (PV), read a brief summary of the molecule's biological role, and access the corresponding PDB entry and Molecule of the Month column. Users can highlight structures in the Molecular Machinery viewer based on functional category. For instance, selecting "Blood Plasma" from the right menu highlights the structures shown that are involved with transporting nutrients and defending against injury. The "Auto Mode" option will automatically launch a tour of the structures, highlighting the different categories of structures and the individual examples. The 3D view uses PV to rotate the molecule, use different depiction styles, and zoom in/out of the molecule. This mode can be used as a screensaver or as a kiosk display. Users can access the Molecular Machinery Viewer from mm.rcsb.org and from the Educational Resources>Animations section of PDB-101. This viewer was designed and developed by Robert Lowe, Maria Voigt, and David S. Goodsell.